Bill Maher: Is Hillary Clinton Going To Run For President? 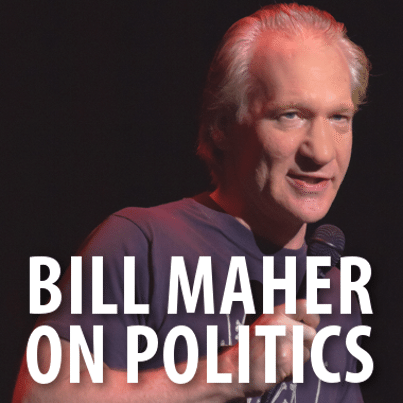 Bill Maher said he firmly believes Hillary Clinton will definitely run for president. He said it’s in her blood. He also said she’s really good at handling controversy. Bill Maher also talked about Karl Rove’s recent suggestion that Hillary Clinton has brain damage. Karl Rove’s comment was that she may have brain damage and then he said he was “just putting it out there.” So then Bill Maher said, “I wonder if Karl Rove’s gay lover that he murdered…oh, I’m not saying that’s definitely true, I’m just putting it out there. And I’d welcome someone to say whether it’s true or not,” Bill Maher said. Bill Maher recently slammed Liam Neeson for supporting horse carriages in New York City in a new PETA video. Bill Maher said Liam Neeson was entitled to his opinion. “But I have a very special set of skills. I have empathy,” he said. Sherri Shepherd said the opinion was very unpopular because people in New York love those carriage rides, the horses are being taken care of, and that Bill Maher doesn’t live in New York. Bill Maher said something that was bleeped out. He wondered if one of the horses was Mr. Ed and could talk about how well it was being treated. Whoopi Goldberg wondered if he had issues with the Amish for using horses as beasts of burden. He joked he had other issues with the Amish. Whoopi suggested that she and Bill go visit the stables where they keep the horses in New York City. He responded by saying that he hoped someday people treat horses the way they’d treat other people. Bill Maher is currently doing something on his show Real Time With Bill Maher where he’s encouraging people to help flip a district by getting rid of a bad Congressperson. He’s made a bracket of 16 different bad Congressman and people are going to vote to find the worst one. He said that Congress’s approval rating is usually under 10 percent and somehow over 90 percent of incumbents are returned to office. Bill Maher said he loves to go to red states when he tours. He said he “affectionately” calls them the “car on the lawn states.” He said he likes to go to red states because the liberals that are there are always happy to see him. They never expect him to go there. Bill Maher said he thought President Barack Obama was doing a great job. He said that Obama has had to deal with things no other president has ever had to deal with. “I know the Tea Party hates hearing that, but, you know, they’re racist, because 99.999 percent of them are white and the president who drives them insane is black. It’s just a coincidence,” he said. That last part was said very sarcastically. He also said he never saw a governor stick their finger in a president’s face like the governor of Arizona did, he never saw a president heckled at the State of the Union, and he never saw Bill O’Reilly interrupt a president before Obama. Bill Maher said he thought the Republican Party had lost touch with women voters because they’re against gay marriage, birth control, and prenatal testing, which are issues that are important to women. He also mentioned that Congressman always give “scientific” reasoning behind their thoughts on reproductive rights, referring to several controversies, including when Representative Todd Akin used an unfortunate phrase. Jenny McCarthy wondered if there was any topic off limits for Bill Maher. Bill Maher shook her hand and introduced himself, wondering if she hadn’t met him yet.